This recipe came about in the grocery store. My mother in law and I were shopping for our Christmas menu when she asked if I could make garlic rolls similar to a local restaurant we went to years ago. The garlic rolls were ridiculously buttery with pieces of garlic and minced parsley. So when I thought about those rolls, I figured I 'd wing it and pick up a few ingredients to recreate it at home. Preheat the oven to 350 degrees. 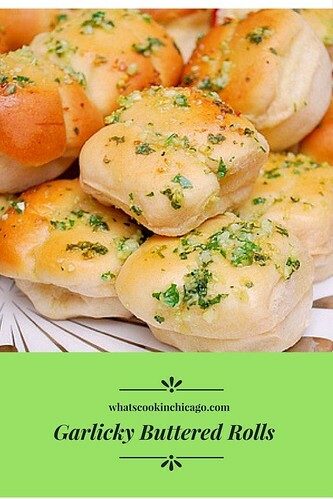 Place dinner rolls on a baking sheet and set aside. In a small food processor, add the parsley and garlic. Pulse until finely minced together. Transfer this mixture to a medium bowl and add the garlic powder, onion powder, salt, pepper and melted butter. Stir and set aside. With a pastry brush, brush the tops of the dinner rolls with the garlic & herb butter. Bake in the preheated oven for 10-12 minutes and remove from oven. 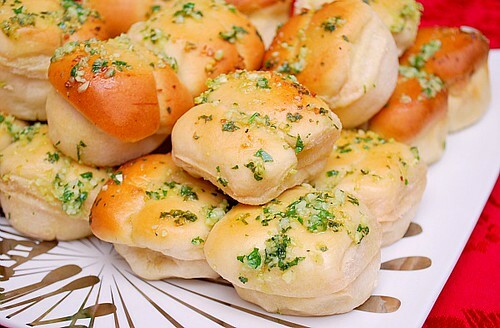 Just before serving, brush the tops of the dinner rolls again with the garlic & herb butter.